The chance to actually own one of these unique GTAs was something that I never expected to be fortunate enough to actually have, but fate sometimes has a way of dealing some excellent hands. I had never even seen one of these rare GTAs outside of magazine pictures..... to get the chance to own one was, quite frankly, very thrilling. 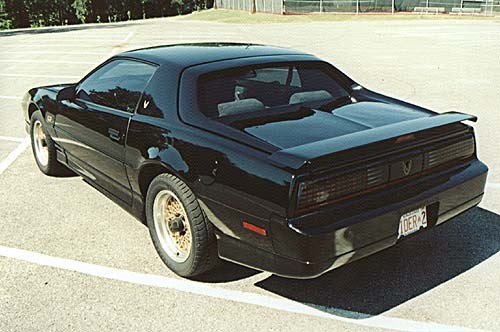 Our black GTA Notchback was built during the second week of January, 1988 at the plant in Van Nuys and was shipped out on April 14 to the selling GM dealership, David McDavid Pontiac in Irving, TX. 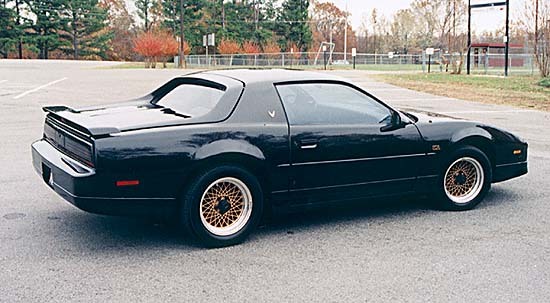 I have not been able to locate the the build sheet for this car either, but I do have all the paperwork on it that shows the invoice, pricing, and shipping dates. The retail sticker price of the car was $20,488, including options, destination charges, and other dealer charges. 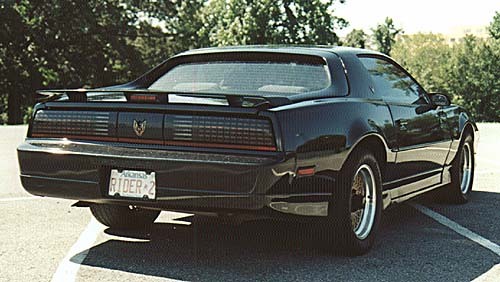 A fluke stop at a local Qwik-Mart netted a copy of the local Auto Trader magazine, where I found this car pictured on the back page in an ad for used Camaros and Firebirds; it was listed as a GTA HATCHBACK. I could tell right away from the photo that something wasn't right with that description. 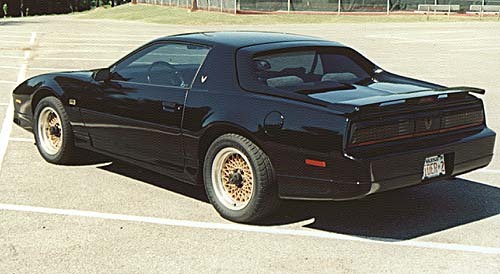 A phone call to the seller revealed that is was not a hatchback, but a Notchback. After I discovered that they indeed still did have the car, I asked the seller why the car hadn't been sold and he said.... "well..... lots of people have looked at it, but they don't think it's right.....nobody's around here's ever seen a GTA that looks like this one". So I figured I was onto something. I asked him if he would care to check for the SPI label and told him it was in the car's console box. He did so and assured me the label was right there in plain view. I then asked him to check for the AA8 code on the list and he left for a second, came back to the phone, and said, "yep, it's the third one on the list....". Talk about your pulse level jumping a little bit..... mine would have destroyed my wife's blood pressure monitor! I asked him if the car was good enough to repair and drive; I wasn't going to make a six hundred mile trip to look at a "rattletrap", regardless of its collectibility. He assured me that it was, and we set off to Dallas three days later. Upon arrival, it quickly became obvious to both my wife and I that this car wasn't going anywhere..... except back to Arkansas with us. I quickly negotiated the guy down to $2500, loaded it up, and took off towards home, not believing my good fortune. The car had some minor body damage to the extreme front end (nose cap, RH headlamp, etc. ), but was entirely functional and drivable..... even the A/C was still fully charged. The seller told me that three times in the previous month, he had resisted the urge to allow the car to be parted out..... sensing that "something good was going to happen to it". The trip back home was uneventful, save for many stops to make sure the "cargo" was well secured. 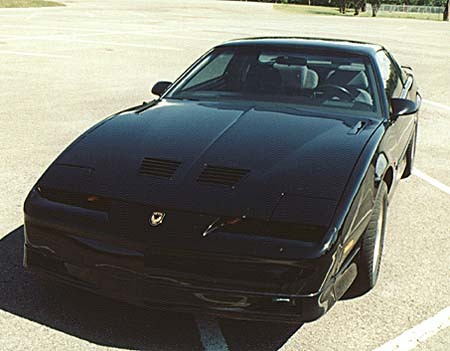 During the first trip to my local Pontiac dealer for servicing, we discovered that the car had been tampered with, stolen, and then most likely was crashed during an ensuing joyride; that allowed for the salvaged title that the car had when we got it, despite the minor damage. A quick call to the selling insurance company netted the facts, and I was able to rest a lot easier. After some minor repairs to the front end, she was ready to go. Our car has 114,600 original miles on it right now and has only been in the repair shop twice since we've had it..... once for an A/C retrofit to R134A, and then a unscheduled stop for a new radiator during last summer's National Third Gen Gathering in Norman, OK. Other than that..... nothing, which I feel is fortunate since we don't know a lot about the car's maintenance history. 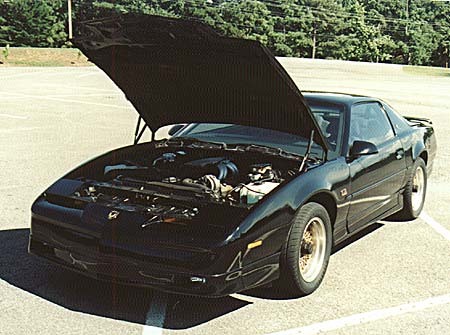 My GM dealer has said, though, that it appears that the car was regularly serviced and/or repaired by a Pontiac dealership..... which lets me breather a little easier. We have repaired a few things on the car over the past couple of years; the headliner was redone last summer, we replaced a dirty sunvisor, etc..... you know, the usual twelve-year-old worn out items. 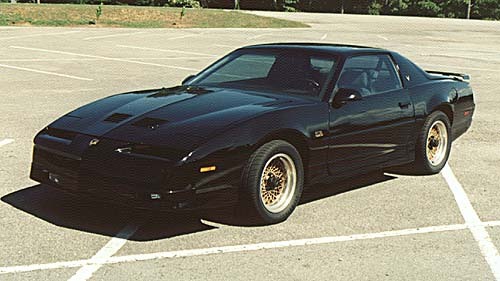 We also had the car painted prior to the Trans Am Nationals last August. The R134A and condenser repair caused me to have to forego the basecoat/clearcoat paint in favor of an enamel/clearcoat paint system, but the car still looks really great. Mechanically, the car is still in its OEM stock, 225-hp configuration; being that my wife drives it most of the time, it's likely that it will remain that way for some time. In time I hope to add some things, like the strut tower brace, and maybe some of the same TPI system work that my red GTA has undergone. But for now it's all right just like it sits..... I'll trade a little bit of performance for the rare privilege of owning an authentic Notchback GTA. We enjoy taking it around to various shows and meets; it always garners a lot of attention, since most people have never seen one in person; they are always curious to look at it and see how the decklid works..... some even are, I feel, a bit disappointed when they learn that underneath the cars are the same..... the Notchback was just a fancy little "gadget" that Pontiac used to change the car's lines up a little bit. So far we have won trophies in two of the car's three outings: a pair of Second Place trophies, which just gives us something to work harder for in the future. Our Notchback GTA is one of the 624 Notchback GTAs built in 1988 (6.5% of production); in addition, 2,717 GTAs were equipped with the Medium Dark Gray custom cloth interior (27% of production), like this car has. A total of 8,956 GTAs left Van Nuys with the big-gun 5.7L TPI V8; this represents some 88% of the total GTA production in 1988. So this is HECTOR; I hope you enjoyed this feature on our own little part of GTA history..... If you have any questions or comments, please feel free to let me hear from you.